I spent a significant portion of my undergraduate career fooling around with the outdated seismology lab in the Loyola Physics department. 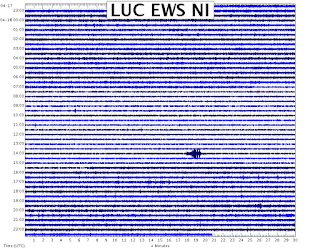 Though I did eventually connect the seismometers to a computer and was able to record activity, they usually are not running as there is currently no student interested in checking in daily. However, we do turn them on every now and then for a lab that the physics students do. So, we hooked everything up yesterday, and BAM, the biggest earthquake in many years hit Chicago this morning. We captured the quake, and I am positively thrilled. Two traces are below. 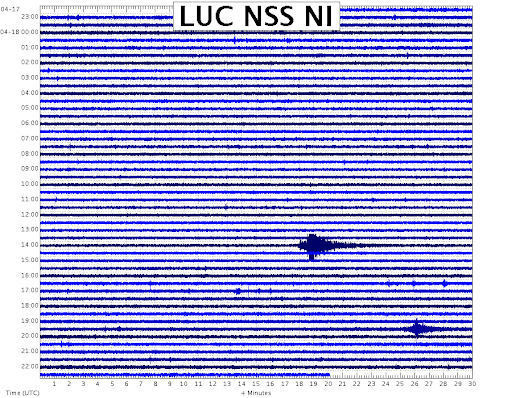 The times are way off (clock drift), but you can clearly see the quake on the 14:00 line. Also, apparently the after shock was centered in “Bone Gap, IL”! Ha! Amazing.